Against my better judgment, I stayed up until 11:00 pm Wednesday night, finishing up this Quinn Bag, even though I had to be up at 5:30 am so I could be out the door at 6:15 am to pick up my mother and head to the airport to attend my sister’s medical school graduation. I wanted to finish the project before I left because I was going to see the recipient. Technically, I could have brought it with me and finished it before she left on Saturday, but once I got started, I just kept going until I was done. Finished Dimensions: approximately 12″ x 12″ body. Handle is approximately 20″ drop. I love this pattern so much. It was first published in 2006. I am not sure how I first came across it, but I do recall that in 2008 I planned to knit every woman in my family one of these as a Christmas present. I made a list of recipients, picked out Peace Fleece colors for each person, and ordered the yarn. Over the course of the next year, I started 3 of the bags, but did not finish any of them. They languished in my UFO (unfinished object) pile for years. In January 2013, I decided that one of my goals for the year was to clear out clutter. One task on my list was to go through my UFO pile and make a decision about what would happen with each project. By the end of the year, I would finish or frog everything in the pile. As I sorted through, I came across the 3 partial Quinn Bags, and remembered how much I loved the pattern. This would be the year of the Quinn Bag! The list of recipients had changed a little since I first decided on this project. My grandmother and great aunt passed away. Two of my cousins got married, adding two new women to the family. Some family members no longer exchange gifts. In total, I needed to knit 9 Quinn Bags, including one for me. By the end of November, I had the knitting part of 7 bags totally complete. Body, handle, finishing work, everything. I had also completed the bodies of the other 2 bags, but still needed to do the handles and finishing work. I also needed to line all 9 bags. I have little sewing experience, so asked my mother to help me with lining the bags. Together, we picked out fabric for each person. I measured each bag, cut out the lining pieces to the right size, and cut out the pocket pieces. My mother machine sewed the pockets onto the lining and seamed the linings into a pouch. I then hand sewed the linings into the bags. The two bags without handles were my mother’s and my Aunt Holly’s. My mother decided she wanted to resew the lining on her bag because the pocket wasn’t quite big enough to fit her phone. I knew this meant I would not be able to have her purse done before Christmas. We drove from Florida to Connecticut for Christmas, and I brought the yarn for both bag handles with me, planning to knit Holly’s handle first, so I could get her bag done before Christmas morning. I planned to knit the handle for my mother’s bag after Christmas. As you can see from the picture of the bags blocking, the two bags are quite similar in color. In the car, in the dark, I picked up one of the yarns and started knitting the handle (it is 4 strands of 2 stitch i-cord). When we arrived in Connecticut, I discovered I had been knitting the wrong handle! I had picked up the yarn for my mother’s bag instead of my aunt’s. There was no way I could finish Holly’s in time for Christmas. I gifted the bag anyway, and took it back so I could finish the handle. I got all the handle knitting done by the end of March, but had not braided it yet. 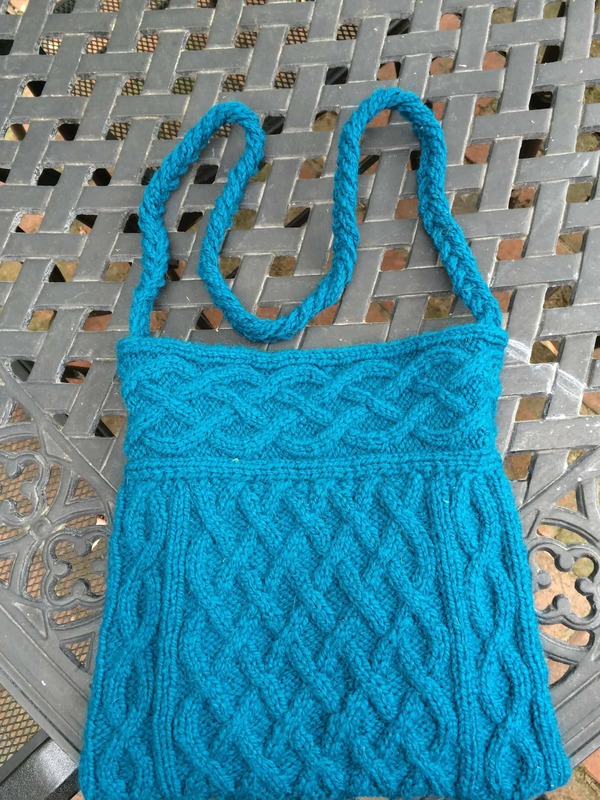 This month, I braided the handle, sewed it into the bag, and sewed the lining into the bag. All told, it took me about 3 hours to do this finishing work. I gave it to Aunt Holly the afternoon we arrived in Baltimore. 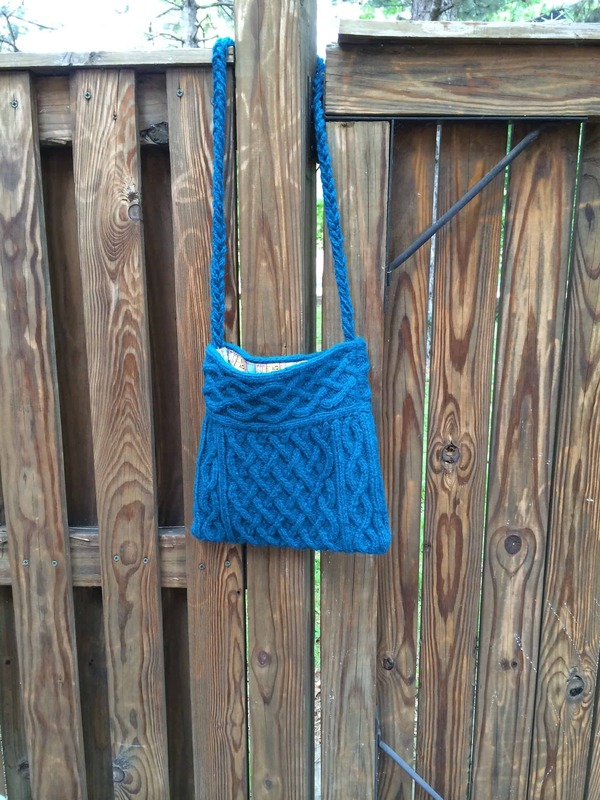 Despite the complex appearance of the cables, the bag is a fairly quick knit. The first one or two took longer as I got used to the pattern, but after that the knitting portion took about 20 hours. 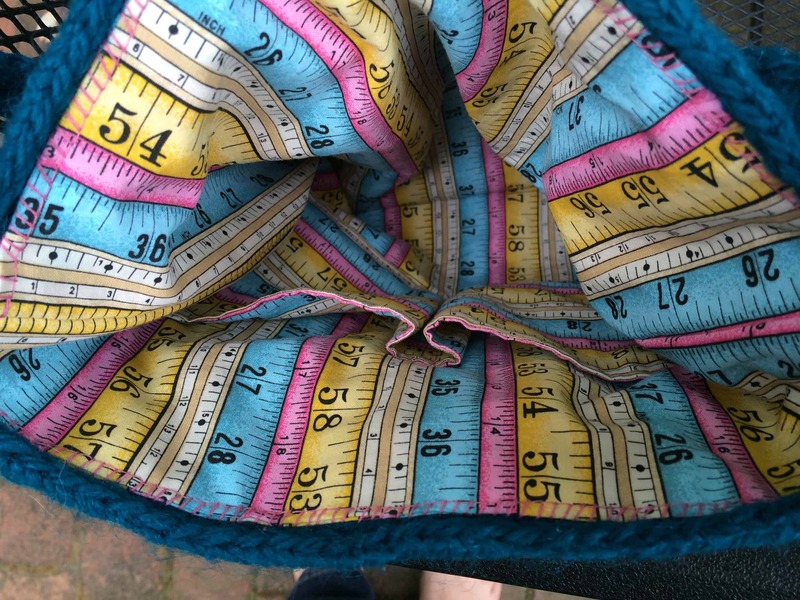 The finishing work, including braiding the handle and sewing it into the bag, sewing the lining, and hand sewing the lining into the bag is another 4-5 hours. It is a fun and beautiful project. The pattern is well-written. I highly recommend knitting one for yourself!